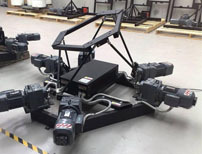 Since 2003, CKAS Mechatronics has been specialising in all aspects of simulation engineering, and is particularly focused on Flight Simulators, Driving Simulators, VR Simulators and Motion Systems for Simulators. With a full team of professional engineers, our design practices are based on academic rigour, and the results of our efforts have been acknowledged in the past by various bodies, including the Endeavour Awards Committee in Australia. CKAS boasts some of the highest calibre customers, including NASA USA, Walt Disney Imagineering USA, Warner Brothers Studios USA, Thales UK, Airbus Industrie France, EADS Europe, Sydac Australia, Oktal France, Immersive Technologies Australia and many other first tier corporations. Our products and services are of the highest calibre, and our high end customers depend on the incredible reliability of our products combined with our unwavering support in the field. CKAS Mechatronics maintains the highest standards in design, and adheres to these official standards for all products and services. CKAS Mechatronics head office is based approximately 5 minutes drive from Tullamarine (Melbourne) International Airport, in the northern metropolitan area of Melbourne, Victoria, Australia. Our Head office is also our final assembly facility, with a show room to demonstrate some of our latest products. Clients can visit us at the head office to see our products, and discuss their own development ideas which we can realise for them. Our manufacturing facility is also located close by, and this department is fully equipped to manufacture any design we may conceive. 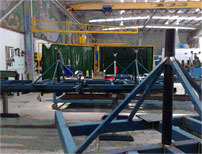 We have access to a full workshop, paint and composite fibre facilities, and as such can produce all our equipment in house.